Health, Wellness and Relaxation with our Spa Water. The true wealth of our hotel lies in thermal water. Immerge yourself and you will immediately experience wellness! At your disposal, every day, from 8 a.m. to 11 p.m., our communicating indoor and outdoor thermal swimming pools with hydromassage and aquaFit corner, open-air HydroRelax tub, relaxation area by the indoor and outdoor pools with beds and chairs. Gentle recovery using spa water. This is spa water hydrokinesitherapy, the maximum in rehabilitation programs for functional recovery. The low gravity of the water reduces joint loading, allowing movements that are impossible when "dry". Recovery without pain, without risk, and with less stress. Spa water, with all its benefits and properties, is used. It significantly reduces recovery time. This practice adds an important draining action to all of the benefits that come from contact with spa water and ozone therapy. It is a revitalizing and stimulating massage for peripheral circulation, which is carried out in an ozonated spa bath, with pump pressure at 2/3 atmospheres along the lymphatic pathways. Perfect for the legs, belly and arms, it prevents or minimizes the appearance of soft cellulite, boosting tissue metabolism, and protects against the accumulation of fluid and the formation of fatty deposits. Journey to the depths of relaxation It helps release physical and mental tension facilitating the return to the surface of unconscious memory bubbles and helps overcome emotional blocks. It combines various water techniques such as watsu, aquabalancing, and wassertanz with other techniques such as reiki, osho-prana-healing, and reflexology. It increases water skills and is extremely gratifying. Floating Room. Sensorial float tank. An innovative way to augment your capacity for wellbeing, visualization and mental clarity. 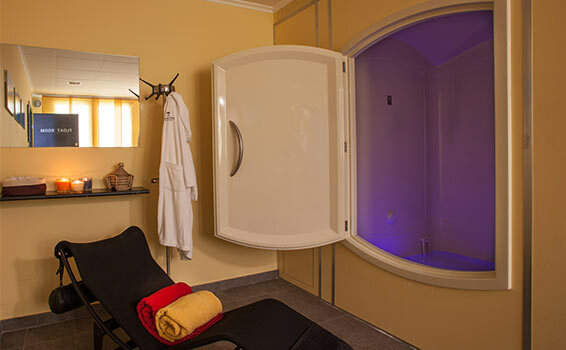 This tank filled with salty water at body temperature lets you float in the near absence of gravity for a new sensation of deep relaxation and a “parasympathetic” response that frees the organism from the constant effort of monitoring body temperature and orientation to gravity. Under these conditions, the body begins producing endorphin, a substance closely linked to wellbeing and the joy of living. 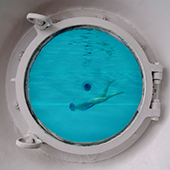 The float tank is also an excellent way to enhance sports performance.